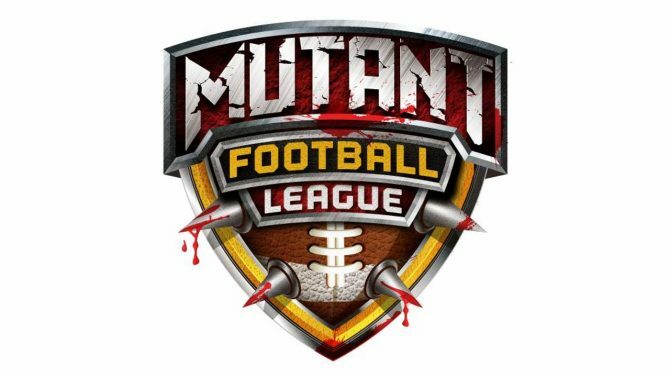 Mutant Football League: Dynasty Edition Review -- Are You Ready For Some Murder? Mutant Football League: Dynasty Edition Review — Are You Ready For Some Murder? 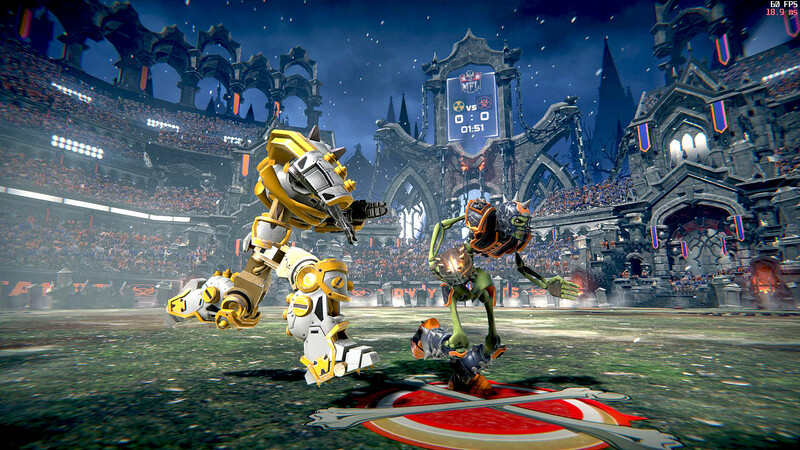 Mutant Football League sticks an irreverent spike into football’s vanilla veins, giving the sport's metagame a much desired shot in the arm. Ah yes, football — America’s favorite sport. Every Sunday, millions of Americans tune in to watch their favorite teams throw the ol’ pigskin down the field, kick field goals, and occasionally commit brutal acts of murder. Actually, that last one is only exclusive to Mutant Football League: Dynasty Edition, the newest entry in the Mutant Football League franchise from developer Digital Dreams Entertainment. Serving as a spiritual successor to Electronic Arts’ 1993 Sega Genesis title of the same name, Mutant Football League serves an outlandish, over-the-top, and much-desired arcade-style take on American football. 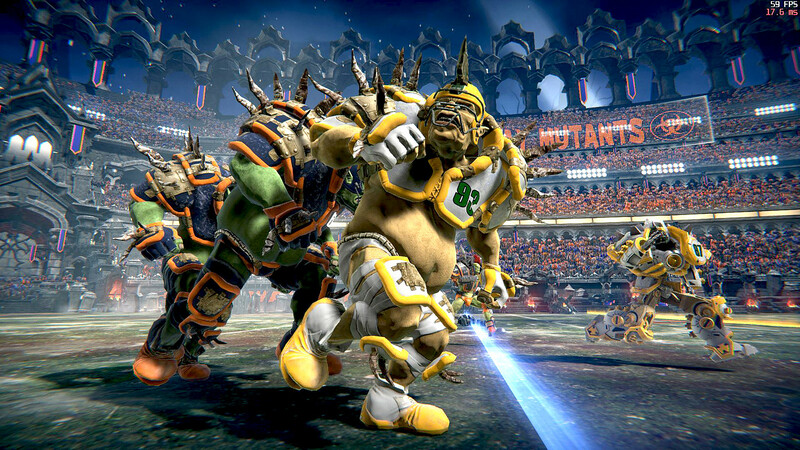 Mutant Football League inhabits an increasingly rare market space. Sure, it’s an arcade-style sports game, but it also packs more production value than the small, hand-crafted zany sports titles that are common in the indie-sphere. The days of mid-budget, ambitious arcade-sports titles are mostly behind us; games like NFL Blitz, NBA Jam, and NFL Street are tangibly absent from the gaming market with the only games filling their gaps are charming, yet ultimately scaled-down titles. While new sports games like Super Volleyball Blast and Super Sportsmatchen offer minute, bite-sized arcade experiences, their scope is much smaller. Mutant Football League offers a solid, well-crafted median that fits between officially licensed, annualized sports fare and pithy indie romps. In this vein, Mutant Football League offers an enjoyable, mid-budget alternative to 2K Sports and Electronic Arts’ sports game monopoly. While Mutant Football League fundamentally lacks the multilayered, pristine polish of a high-budget AAA game, it offers a well-balanced mix of traditional sports fare and goofy, high-octane antics. Of course, these antics are the meat and potatoes of Mutant Football League‘s sales pitch — there’s football, there’s surreal fast-paced gameplay, and there’s lots of havoc to wreak. 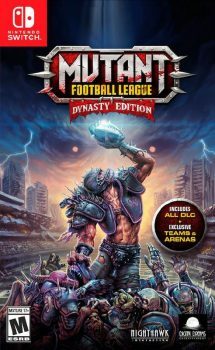 The brunt of Mutant Football League follows the traditional football formula: driving the ball to the opponent’s end zone and scoring a touchdown gives you six points, with the option to score another point through a conversion. When on the offense, each team has four downs to gain ten yards while the other team tries to stop them in their tracks. This is all simple enough, especially since Mutant Football League includes a tutorial mode that teaches players these basic rules. That being said, past this framework, the similarities between traditional football and Mutant Football League end. The most significant way that Mutant Football League differs from traditional football is its slew of Dirty Tricks. 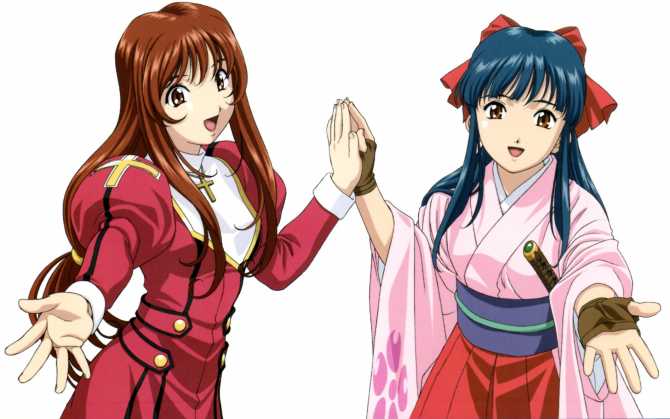 Throughout the course of each game, players are given a finite amount of these Tricks which enable them to bend the rules of the game and conduct plays that would normally be outside the realm of possibility. Each team (which is made up of different factions, including werewolves, robots, skeletons, and more) has their own unique lineup of Tricks, making each matchup play differently. These variations not only work to make Mutant Football League‘s Dirty Tricks feel fresh but to give each different team their own distinct feel. Throughout my time with Mutant Football League, I usually played as the Grim Bay Attackers, mostly because I couldn’t pass up the opportunity to play as Airbourne Dodgers. One of the Attackers’ strongest Dirty Tricks is called Warp Speed, which will turn back time and undo the opponent’s last play as if it never happened. While this is certainly a useful Trick on its own, I started to incorporate Warp Speed into a larger strategy. If it looked like the other team was approaching the end zone I would bribe the referee. As a result, after the team scored, they would be hit with a 10-yard penalty and the points wouldn’t count. As I played, many times the team would usually kill the referee which, in turn, would give them an additional 15-yard penalty. At this point, the other team would need to clear 25 yards for a first down. If they did manage to clear the distance (usually using one of their own offensive Dirty Tricks), I would use Warp Speed and undo all of the traction they made. I would recommend reading up on each team’s Dirty Tricks before starting Mutant Football League. One of my earliest games of Mutant Football League ended with unbearable disappointment after my team beat the clock to put one last touchdown on the board and take the lead. Much to my chagrin, the referee was bribed by the other team and I ultimately lost the game. A similar scenario occurred when I forgot that the amount of points rewarded for field goals is graduated: meaning, the further the kicker is from the goalposts, the more points are rewarded. In addition to Dirty Tricks, Mutant Football League also adds murder to the classic football formula. Have an opponent with a really good quarterback? Try to kill them! Mutant Football League gives every player their own health bar which can be depleted through in-game attacks. Different characters administer different amounts of damage and certain Dirty Tricks can kill players altogether. Mutant Football League’s offbeat, seemingly nonsensical rules work to make football more strategic, and honestly, more exciting. Imagine you’re at the goal line about to score a go-ahead touchdown. Do you think the other team bribed the referee, a play that will ultimately void your touchdown? Should you kill the referee or try to bribe him yourself? The former will give you a fifteen-yard penalty while the latter means wasting one of your bribes if you can’t call your opponents’ bluff. Additionally, the game’s surreal (and often gratuitous) death mechanic works to add another layer of depth. Managing your players’ health while dishing out damage onto the opponent’s team becomes a crucial part of Mutant Football League‘s gameplay loop. 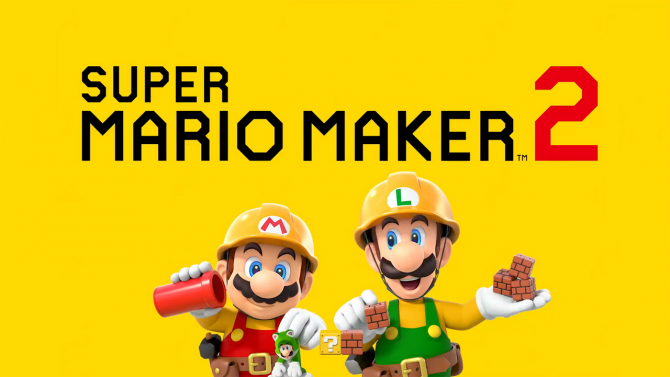 Building off of this feature, the game includes a half-time minigame that (if completed) will allow players to revive one of their players mid-game. Mutant Football League uses these mechanics as stepping stones and ultimately builds off of them through play. The game’s smorgasbord of different fields each include their own unique hazards; the Grim Bay Attackers’ field includes a sheet of ice that players can fall through, while other fields contain land mines, buzzsaws, and other deadly flourishes. 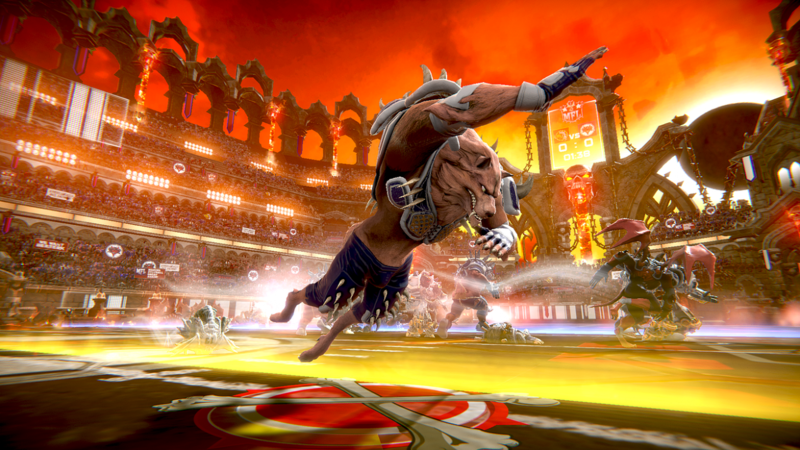 These items, similar to Mutant Football League‘s Dirty Tricks, emphasize the game’s strong chaotic, fast-paced playstyle. Casual players will find these items as just another part of Mutant Football League‘s chaotic allure, while more experienced players are forced to keep them in mind when formulating strategies. 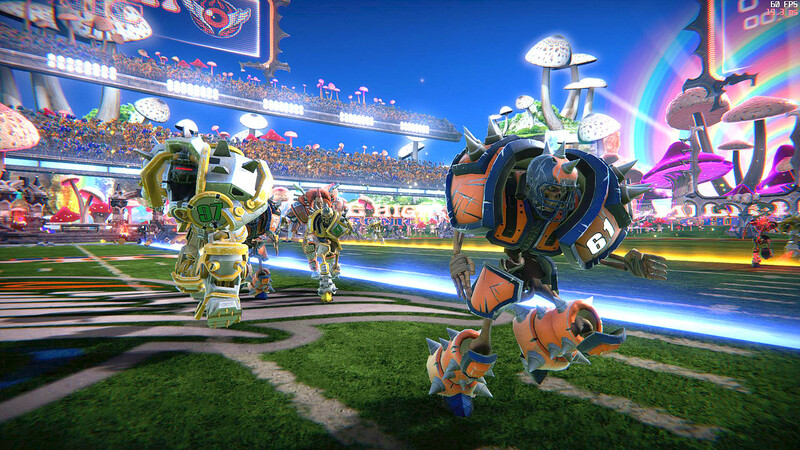 When it comes to game modes, Mutant Football League embraces its arcade roots. 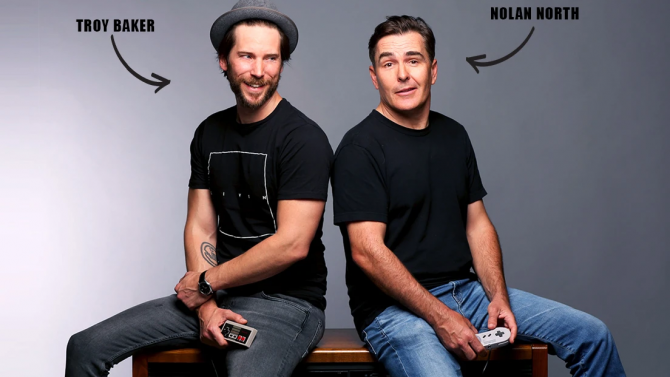 While the game’s Dynasty mode offers players a comprehensive way to manage one of their teams, make trades, and level-up players, the game largely relies on its arcade-style rather than offering a multitude of different game modes. This works in the game’s favor– rather than focusing on alternative game types or shoehorning in a half-baked story mode, Mutant Football League is able to offer variety through the entropy of its core gameplay loop. 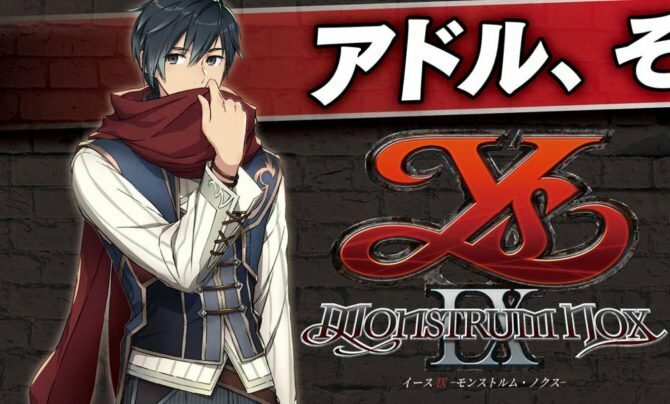 Seeing as the game retails for $29.99 (with all of its DLC), the game never feels light on content. Its frequent allusions to contemporary football players and current NFL teams serve to fill the game with a real sense of substance, building off of the football of our world and making it something much more fun. One of the things that struck me when playing Mutant Football League is how perfect this game is on the Nintendo Switch. 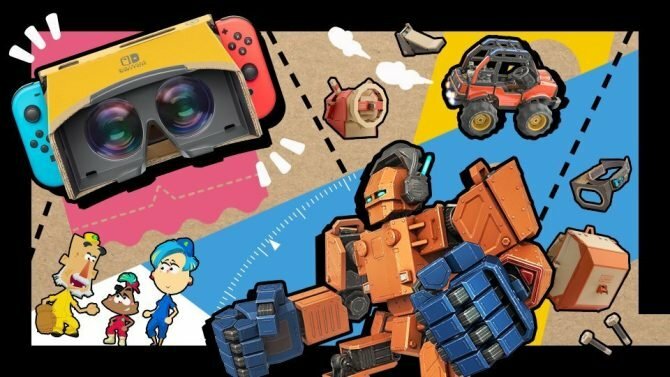 Sure, the Switch port’s graphics aren’t stellar and the game crashed on me twice. However, that being said, Mutant Football League is great for bite-sized gaming sessions, even allowing players to adjust the length of each game in its Dynasty mode. If you can live with the game not being gorgeous (and occasionally, it seems, crashing), Mutant Football League on Switch seems to be the definitive way to get your sports fix in a short period of time. With this garden variety of irreverent zaniness under its belt, Mutant Football League offers a tantalizing alternative for football fans that are tired of Madden or fans of arcade titles looking for some quick action. 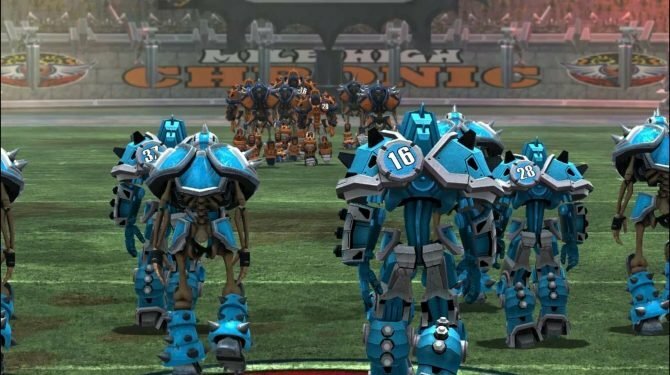 Mutant Football League sticks an irreverent spike into football’s vanilla veins; it gives the sport’s tired metagame a much desired shot in the arm. While I doubt those that are genuinely uninterested in football will enjoy Mutant Football League, players with a passing interest in the sport will most certainly find something to enjoy. Digital Dreams Entertainment has finally confirmed that Mutant Football League will hit PlayStation 4 and Xbox One on January 19, 2018.